This classic 7UP TV ad from 1982 which featured the latest craze at the time, PAC MAN and a modified version of Kim Carnes ‘Bette Davis Eyes’ which was in fact sung by her in the commercial. This probably my most memorable TV advertisement of the 80’s. 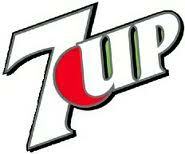 7 Up is a brand of a lemon-lime flavored non-caffeinated soft drink. The rights to the brand are held by Dr Pepper Snapple Group in the United States, and PepsiCo (or its licensees) in the rest of the world, including Puerto Rico, where the concentrate is manufactured at the Pepsi facility in Cidra. The 7 Up logo includes a red spot between the ‘7’ and ‘Up’; this red spot has been animated and used as a mascot for the brand as Cool Spot. Vitalite is a sunflower oil-based margarine, produced by Dairy Crest in Kirkby in Merseyside. It began in 1983, being made by Kraft General Foods. In 1996, it was bought by St Ivel, who were then bought by Dairy Crest in November 2002. In 2008 it was relaunched as a dairy-free spread, making it suitable for vegans. A famous advertising campaign in the UK during the 90s featured dancing sunflowers and a singing Sun with a parody of the song Israelites by Desmond Dekker.